Hi everyone, for the past few months I’ve partnered up with the lead developer of Lightspeed Frontier, and we recently released a closed Alpha of the game. The game takes place in a universe where modular lightspeed travel technology has recently been made available to the common man, and you decide you want to try your hand at commanding a ship in the outer reaches of space. What you find is that a lot of… precarious individuals have already made it their home there. Between the crime lords, scavengers, and corporations, you run around completing missions, exploring space, and accumulating more powerful modules for your ship. We are looking for testers who can help shape this game from a very early state. The current version has a lot to do currently, but we definitely need more feedback from some skilled testers. If you just want to try the game, PM me and we can chat. Here’s a trailer! Just post here with how I can get you a copy of the game if you’re interested. Thanks for the help! The modules in the game offer all kinds of different properties and uses. 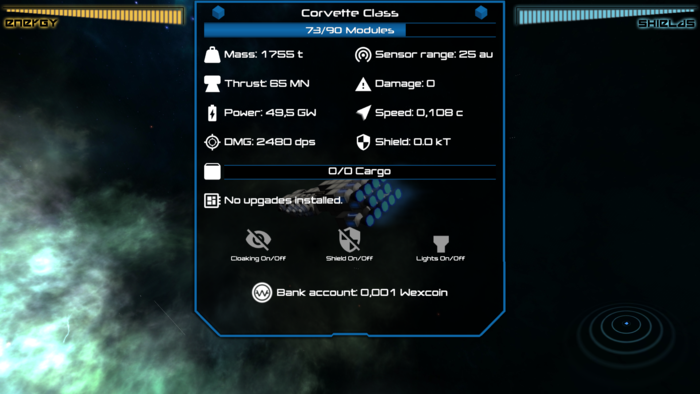 From guns, to shields, to cloaking, to utility modules that buff your ship in general (think Diablo 2 Unique items), so to portray those in an easy to skim fashion, here's our first whack at a stats screen! As someone who works already in the game business, I will give you a tip. Never give out a game copies (steam versions) to anyone for free, they will most likely be sold to a black market site, hurting only you. Until it's released, you should only give it you QA testers, or run a timed alpha/beta tests. not something id be interested in.